Pacific Island Countries: Born Identity: Give every child their birth right. Born Identity: Give every child their birth right. I am young person. I have goals and ambitions in life. I have a passion for photography. I like to capture special moments that turn into beautiful memories. My name is Benjamin Cola. I am 18 years old. I am a Fijian. This is my identity! I believe I am fortunate to be born in a Pacific Island Country and have my identity registered at birth and have a birth certificate to be recognised as an individual who has the right to experience life to the fullest. I am also fortunate not to be part of a global statistic showing that 1 in 3 children under the age of five do not officially exist because they have not been registered at birth and do not have a birth certificate. Every child has the right to be registered at birth – to have a name, to acquire a nationality, and to preserve his or her identity. This is explicitly stated in the United Nations Convention on the Rights of the Child (CRC) in articles 7 and 8 that is ratified by 181 countries, including all the countries in the Pacific. However, birth registration rates vary globally. In many developing countries today, the births of a large share of children go unregistered. In the Pacific, child birth registration varies from as low as 20% in the Solomon Islands to more than 90% in Kiribati and Fiji, resulting in a massive number of children born in the region not having any official documentation to validate their identity. A name and identity is every child’s right and birth registration is recognised as a crucial first step that ensures that children have their rights recognized from birth, and access to services throughout their lifespan. Birth registration is the permanent and official record of a child’s existence. It gives children their first right and born identity. Children whose births are not registered may not be able to benefit from the opportunities such education and protection, such as healthcare, due to them. Unregistered children become vulnerable to threats, are exposed to violence and abuse, face discrimination, and are at risk of being deprived access to basic social services throughout their lifespan. The value of birth registration as a fundamental human right continues to be overlooked. There is a continuing lack of awareness of registration as a critical measure to secure the recognition of every child before the law, to safeguard the protection of his or her individual rights, and to ensure that any violation of these rights does not go unnoticed. A simple birth certificate opens up the world of opportunities for a child. It allows them to have access to the world of health care, education, protection, participation, and an identity. Put in place legislation that make it obligatory for parents to ensure their child is registered immediately or as soon as possible after birth. 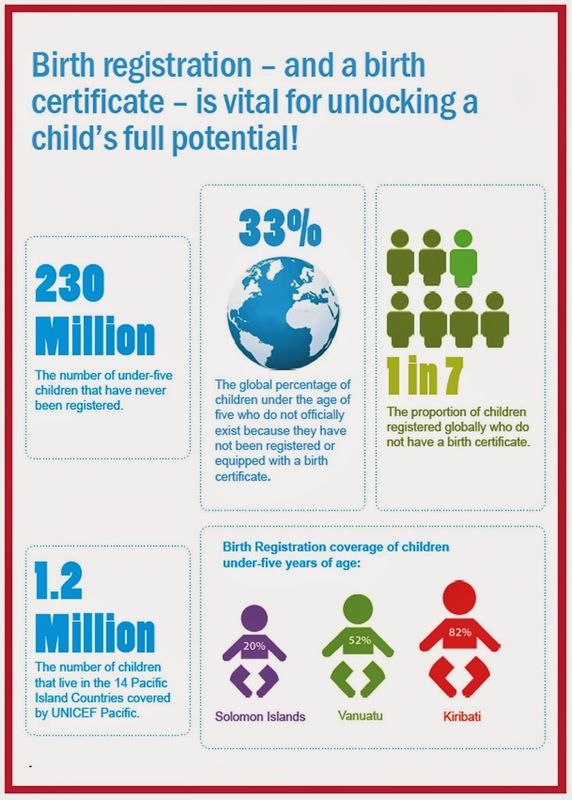 Reach out and continue to create widespread awareness on the importance of birth registration! This article was compiled by UNICEF Youth Mediactivists Benjamin Cola (Fiji) and Matea Nauto (Kiribati). Are you a writer, a photographer, social media guru, or just someone with a passion to help others? Join the movement.